Bleach 652 shows the true relationship between Shunsui and Nanao, after her mother gave him the Hakkyouken sword, she was executed. Nanao recruited into Squad 8 when she finally realized that he’s the man who talked to her mother, the man with the hair pin and pink kimono. Nanao is able to use the Shinken Hakkyouken to cut Lille when Shunsui aids her in this battle. Bleach 652 begins as Nanao faces forward with her Shinken Hakkyouken, Lille asks what sword she has. All Lille can see is a tacky, shiny sword as he’s unable to see the true form. It shines so brightly that one cannot even see the blade. Nanao is glad as the sword reflects the ability of the God it’s facing off against. If it’s reflecting the light from his eyes, it means that it’s diffusing the light that he’s emanating. Lille doesn’t understand but he’s happy that she refers him to as a God. Nanao steps forward as tries her best to strike him. We go to the past where Nanao’s mother talks to a man, she mentions that the sword she holds is something that will only respond to the Ise House. No misfortune will fall on him, there is only this man who she can trust except for those in the Ise House. She tries to give him the sword as Nanao listens quietly from inside the house. The first thing she notices was the hairpins on this man. People talk about this man who is a captain and visits the head master often. Nanao notices that she watches him from afar, he always wore a cloak with a woman’s kimono, it was a common pattern that you could find anywhere. The only sentiment was that she knew her mother had a similar one. She also notices that hairpins, they were just like her mothers. Nanao once day notices that she has been proposed to join the 8th Division of the Gotei 13. At the time, she was living with people who were friends of the Ise family, after her mother had died. They treated Nanao like their own daughter. Still, Nanao was unable to make the Asauchi that was provided, she did not have a zanpakuto, thus she had thought she could get into the Kido Corps. However, somehow she was assigned to the 8th Squad. Nanao went to meet her captain when she quickly noticed that it was the person with the hairpin. Shunsui had changed his haori and removed the hairpins, Nanao quickly noticed that it was him. It was Shunsui who had accepted the Shinken Hakkyouken from her mother. We return to the present as Nanao strikes and cuts Lille’s arm. Lille however parried the attack and quickly learned that this sword could be a problem later on. Thus he charges up an attack where he plans on attack Nanao with. It gets brighter and brighter as Nanao notices that it’s going to be a big attack. Lille mentions that he shall not let his guard down as a God. Shunsui remembers that he had always blamed himself, he learned about the execution a day late when the Central 46 put out an order to execute Nanao’s mother due to the loss of the Shinken Hakkyouken. We move onto when Shunsui’s brother gave him the hairpins. Shunsui realises that those who give him precious things eventually die, it’s a heavy burden and one most difficult to bear. He thus asks Nanao to forgive him for taking charge of her own sword, and that she shall take the weight off his shoulders. He mentions that he shall protect her. Shunsui appears from her shadow and tells her that it’s time to go. Bleach 652 ends here. A magnificent chapter, so much awesomeness was incorporated into this crazy chapter. Like other chapter which seem short, this one was definitely not. 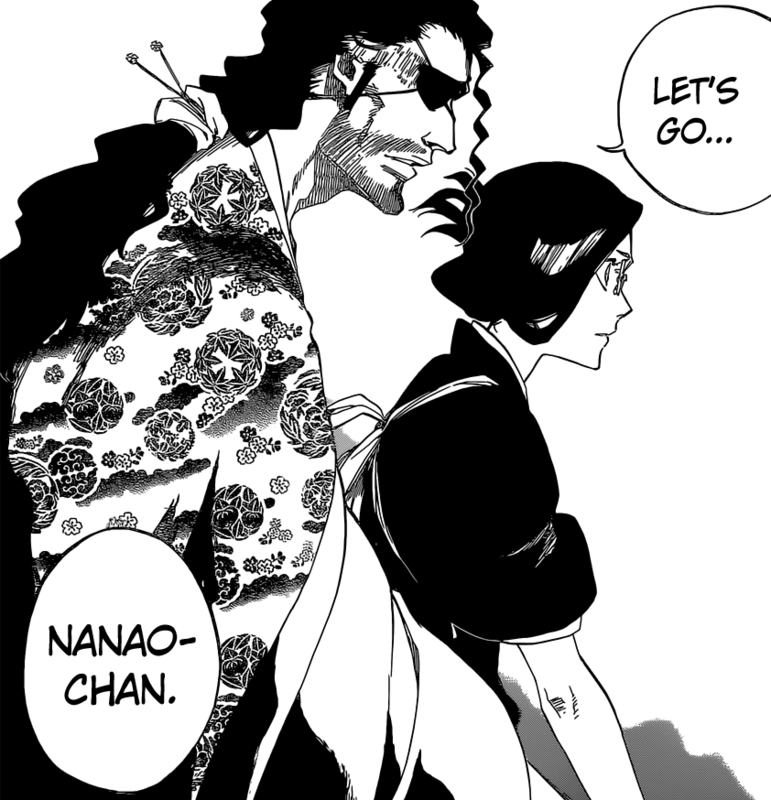 Nanao and Shunsui will definitely kill Lille, I think. And the past about Shunsui’s hairpins and cloak have been revealed. 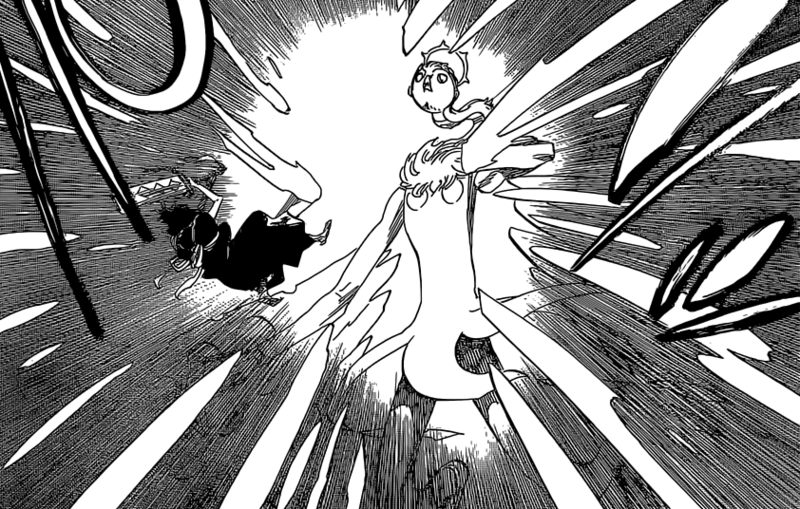 Can’t wait for next week’s Bleach 653 when the battle intensifies further. So I guess the time line isn’t messed up after all. Nanao is pretty old than. Shunsui and Jushiro were the first Shinigami that graduated the Academy to become Captains. They even mentioned Shinji and Aizen as Captain and Lieutenant of 5th Division. Her skill in Kido is amazing. So basically, her now Zanpakuto Shinken Hakkyouken, has the ability to reflect the power of a celestial being or god, and can cut that being. Sense she did cut off Lille’s left am. Just shows how corrupted Central 46 is for executing her mother. 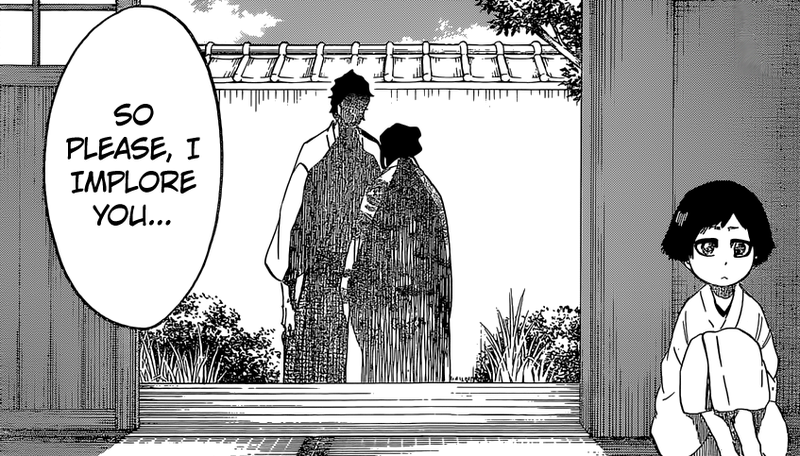 This Zanpakuto must really be a curse, because the elderly couple that took Nanao in had an elderly man. He didn’t die when marrying his wife. Unless they aren’t married and just a couple. I expected nanao to have shunsui’s assistance in dealing with lille. She actually manages to do some damage to lille. I like how his arm was dispersed into the 8 directions like the legend of her sword says. But lille is still an elite sternritter so it was obvious that a vice captain would not end the battle by her loneself. I’m expecting the finishing blow to dealt to lille probably next chapter. Either way like I said before I don’t see how this fight is going to go past chapter 655. This fight will end soon. But I believe it will end in 653 or maybe 655. Now That Lille knows what her Zanpakuto can do, he’ll be more aware. I’m glad Shunsui is helping. It makes it more realistic sense he’s a Schutzstaffel. 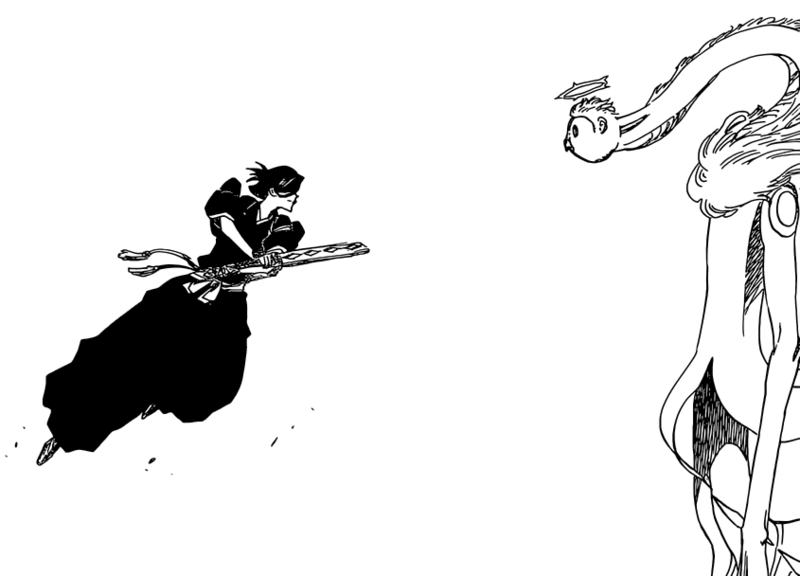 Also, did you notice how Kubo kept pushing the time for the flashback? I mean, first Shunsui sees her mother when he’s older but not a Captain when Nanao was a child. Than she enters in the 8th Division right before the the events with the Visord. Than we go to her mother being executed right when Shunsui and Jushiro graduate the Academy. I guess these two aren’t as old as I thought. I’m having my doubts that Shunsui and Jushiro were part of the original Gotei 13. Maybe they became Captains right after they graduated? Which was 1000 years ago? That means Nanao is older than she seems. Yes I did notice that. but still, Nanao was shown to be a child 100 years ago during the visords incident, how could she still be young after all that time since she was a child even before shunsui became captain? That’s the only issue Kubo needs to explain. Either Nanao is older than we thought, or Shunsui is younger than we thought. if so, means that Ise is more than 1000 years old, yet after 900 years has past she still in child form??? Is it possible that Shunsui and Jushiro are under 2000 years old? I mean Chojiro isn’t. I don’t actually remember the flashback with Chibi Shunsui and Yamamoto at his Academy. I’ll look back at the chapter and see. It seems clear that Nanao isn’t that much younger than Shunsui. This would make way more sense if Kubo just made Nanao look the same as she does now 100 years ago and have this flashback of her as a child graduating from the Academy. Like all the Visord look the same. but the problem is Nanao still a child in 103 years ago while Ukitake and Kyoraku already looks like they are in the middle of their age in Pendelum Arc, yet this chapter shows that Nanao is STILL a child for at least 203 years ago (before Uki/Kyo become captains and they are so young)…what i’m trying to say is how come Kyoraku aging so fast just in 100 years but Nanao kept her child state for more of hundred years? I have no idea to be honest. I don’t know why Nanao ages so slow but in 100 years she’s a grown adult. It actually wasn’t stated that Shunsui and Jushiro were only Captains for 203 years. It was only stated that when Hikifune was promoted, Shunsui, Jushiro, Unohana, and Yamamoto were the only ones that were Captains for over 100 years. Oh ya fair enough. I should have done the math myself. Thanks dude 🙂 if Shunsui and Jushiro became Captains for at least 213 years, how come Shunsui as a child was with Yamamoto at his Academy with his appearance from 1000 years ago? Also, the whole Nanao age thing is so weird. I was thinking maybe she just ages longer like Hiyori. But I was wrong. Before she became a Visord, Hiyori was around Toshiro’s age, so was Akon, Nanao, Rangiku, Gin, and Shuuhei. While they all grew to be adults, Hiyori didn’t. The Hollowfication stunned her growth. Hopefully this is something Kubo can answer in the next chapter. If not than the flash back from 1000 years ago would help. I want to know if Shunsui and Jushiro are original Captains. Do you remember the novel The Spirits Are forever with you? Kubo said that novel is very close to being canon. More so than any filler arc. In the novel, Shunsui said he was friends with Kuruyashiki, the 7th Kenpachi, over 300 years ago as Captains, he along with Jushiro, Unohana, and Hikifune were already Captains. Shinji said he was not a Captain. If this is true, than Shunsui didn’t become a Captain 203 years ago, he became one longer. So that means whatever is wrong with Nanao’s growth is more unusual. So that means Nanao is almost or is 1000 years old. Wow how strange. Well I believe that too. Shunsui and Jushiro were 8th and 13th, Yamamoto and Unohana were 1st and 11th, Ichibei maybe 5th, Shutara and Oetsu 3rd and 7th, and Hikifune and Tenjiro 12th and 4th. The others are up in the air. Is it not annoying how the girls need help to defeat their enemies (nemu, nanao, etc) except for yoruichi? Why can’t the girls defeat their enemies for a change? I can’t remember a single time where a female defeated a male in bleach other than rangiku beating that arrancar. If there were other times I would like to hear them because this is getting ridiculous. Ya I’ve noticed that too. Although Rangiku isn’t the only one. Sui-Feng defeated Ggio. I believe she’ll have a rematch with BG9 and he will kill Omeada. Also, Liltotto Killed Pepe by herself, as well as Meninas. Pernida defeated Zaraki. (I know she’s a hand for now, but I believe Pernida is female.) Giselle Zombified like four Captain level opponents. To be fair, they are just lieutenants. In fact, I look at it as Nemu and Nanao needed to help Mayuri and Shunsui because Pernida and Lille are too powerful For them. Oh ya I forgot. Nelliel defeated Nnoitra many times when they were Espada. The reason she was struggling against him when she transformed was because her mask kept leaking Reiatsu, making her weaker the longer she stayed in her true form. Now that Kisuke gave her that bracelet that fixed this program, she’s good to go. Bambietta also defeated Shinji with her Vollständig. Candice and Meninas defeated Zaraki. Riruka used Rukia as a human container. Does that count as a win? Cause Tsukishima injured her with his Book Of End. Shutara killed Nianzol Weizol. And finally Unohana defeated Zaraki so many times for 3 days straight, using her healing Kido to revive him over and over until he reached his full potential. Man me and my brain farts! Rukia defeated Aaroniero and Rudbornn. She also defeated As Nodt. Yes she has help from Byakuya. But I believe she would have killed As without his help. Oh ya I forgot that as well. Rangiku did defeat Izuru and Yachiru did defeat Guenael Lee. Thanks you guys for the refresher but still why can’t kubo make more females defeat strong characters. I’m not saying they should defeat the elite sternritter one on one but maybe they could beat them after the captains wear the Quincies down a little. I’m just saying that I wouldn’t mind seeing a female deal the finishing blow to a powerful opponent. Fair enough. I understand. If this helps , I have a feeling Yoruichi is going to be the one to fight Askin one on one. She’s the 2nd Strongest person in Ichigo’s Group and she’s also the smartest. After Askin defeats a few people (most likely Grimmjow and someone else) she will step in. I also believe when Pernida returns, she will be in her human form and will take on one of the returning Royal Guard. I believe she will take on Shutara. That’s just what I think will happen. & i also dont think that Shunsui & Jushiro were ther in the first quincy war since Yama gave the story about Yhwach to Shunsui wen he was just a boy at the academy when he accidently entered at Yamaji’s office & saw a picture on the wall about the first quincy blood war & asked Yama abt it..
Oetsu for his creation of the Zanpakuto. He also recognized Zangetsu as Yhwach younger. Tenjiro for being the best healer and teaching Unohana, who replaced Tenjiro as the 4th Division Captain when he go promoted and after she fought Zaraki. Hikifune is probably one as well. Yup the time line is strange. Regarding Hikifune, when she was promoted, Shunsui and Jushiro were talking about which Captains were left that have served the longest. He said it was only him, Jushiro, Unohana, and Yamamoto. That means Hikifune was portrayed to be as old as them. Tenjiro is an original because he taught Unohana Kiado. Shutara and Oetsu are original because they both have met Yhwach before we even invaded the Royal Realm. I can only concluded that Nanao is much older than she seems. Or that your right, Shunsui and Jushiro weren’t original Captains. Maybe hikifune was a genius that was promoted to squad zero because of her skill. I think shunsui said something along the lines of them being the only captains who haven’t changed positions in over 100 years. Which means its possible that other captains were changing positions but still older than most captains. Makes sense. Our of all them, Unohana is only one that changed her position, not rank. She was the 11th Division Captain, but after meeting and defeating Zaraki, she asked Tenjiro, the first 4th Division Captain, to teach her Kiado. Than when Tenjiro created the healing hot springs, he was promoted to the Royal Guard and Unohana switched to the 4th so Zaraki could be a Kenpachi. Yea you’re actually right so I guess kubo or someone messed up big time when dealing with all this fictional history crap. I just want to see battles and backgrounds of characters. I no longer care about the timeline. Me too. Its too confusing to get my head around at the moment. That’s why I hoping for a Lille flashback. At least half a chapter. Sense we are moving to Gerard, it is possible that Shinji will get a flashback. Maybe when he became and Captain and became friends with Hikifune. It’s pretty obvious that shunsui & jushiro wasn’t part of the original captains simply because they were students of Yamamoto which means the only captains who were part of the original for a fact are ichibei, yamaji, and onohana. They probably weren’t students of his. Maybe the entire royal guard were captains. Yamajis students are the oldest captains currently besides unahana so in order to be a part of the first captains means that one have to be close to yamajis age but he only looks that way because of the nature of his job which is being a captain commander which in turn causes much stress. This seems very possible. Considering these flashbacks. Is it possible that Shunsui and Jushiro Weren’t Original Captains but were just Lieutenants? Chojiro is older than them and he was there during the first blood war as the 1st Division Lieutenant. Sense they weren’t the first Captains of the 8th and 13th Division, I wonder who was? In this chapter, we saw that Chojiro’s brother and his wife were in fact Shinigami. His brother is wearing the black uniform and his wife kills Hollows for a living. Maybe one of them was the first 8th Division Captain? And when they died he became the Captain? For the 13th Division I believe someone from one of the five noble families is the original Captain. Like Yoruichi’s relative for the 2nd Division and Onmitsukido, and Ginrei (just guessing cause he looks the same age as Yamamoto). Remember when Kukaku was training Ganju, Ginjou, Tsukishima, and Girikko? She said her uncle would be upset that Ichigo is going to the Royal Realm. Maybe this Shiba guy was the first Captain of the 13th Division? Also, remember the former 3rd Seat and now Lieutenant of the 1st Division Genshiro? He looks as old as Yamamoto and he even survived Yhwach’s destruction of the 1st Division Building when he met Aizen. He seems like a possible original. Also, every perceptive of you to notice how much Yamamoto has aged in the last 1000 years. Ichibei is portrayed to be just as old but he looks younger. Hell, Unohana, Oetsu, Shutara, Tenjiro, and Hikifune don’t even look that old. Yhwach even looks younger but he certainly aged as well. Im only into bleach now coz of the battles & coz i want to see it through to the very end, dont really care abt the story coz Kubo has already messed it up for me to even care dat much abt it,jst want see the rest of the shinigamis bankai’s who i havent yet seen & get thru with the band wagon to the very end..watever Kubo has installed for us good or bad im willing to let him surprise me or disappoint me further..